All Microsoft Exchange servers administrators sometimes have to restore mailbox database. When you restore database you will get .edb file which can be mounted in Exchange Server and then you can use PowerShell console to restore emails, notes, contacts, one mailbox or more and etc. But sometimes you just have to restore mailbox database to find an email in one mailbox or to get all mailbox data which is no longer available in Exchange environment, or you just want to export mailbox or mailboxes to .PST file or .MSG, .EML files. Then you can use some tools. Installation is very simple, just download EDB to PST Converter and run it. To use this tool you need to install also Microsoft Office on the same workstation where you have installed EDB to PST Converter. The software converts online Exchange Server databases to PST files to make sure the conversion is least likely to impact Exchange users. Exchange administrators with full privileges for each mailbox can export all user mailboxes to PST files in a single attempt. The EDB PST Converter is equipped to perform EDB to PST conversion in offline mode, i.e. when the Exchange database is taken offline. The software enables administrators to provide users access to mailbox data in times of planned or unplanned Exchange Server downtime. Also in those mode you can convert Public Folders database to PST. First you need to activate Converter to do this, select either ‘Convert Online EDB To PST’ or ‘Convert Offline EDB To PST’ to open user interface, next click ‘Activate’ menu on the menu bar and select either ‘Activate Online’ or ‘Activate Manual’ from the drop down menu. 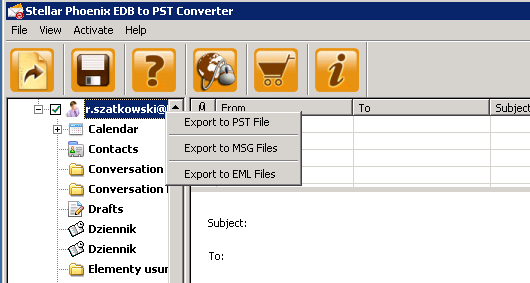 When you select Convert Online EDB to PST then you can connect to your Exchange Server. You can select one mailbox or you can connect to all mailboxes on server. Remember you need to have full access permission to mailboxes which you want to connect. 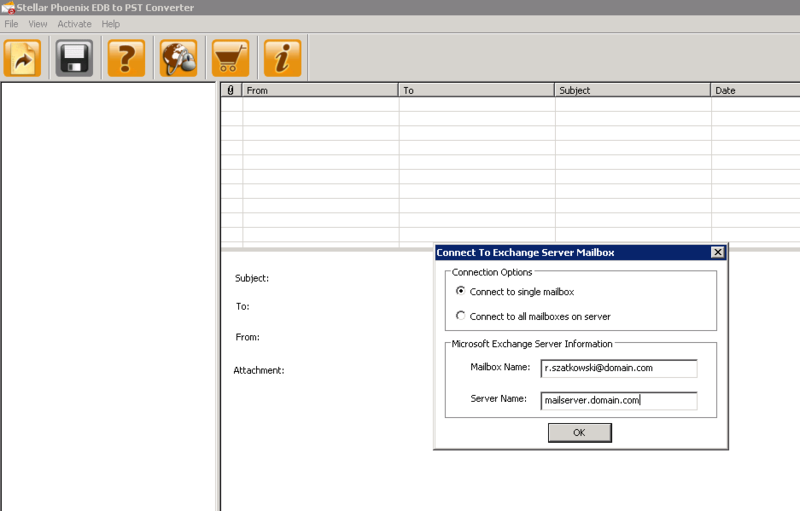 Converter connect to mailbox or mailboxes really fast, but it depends on how many mailboxes you have on Exchange server. Also when you select connect to all mailboxes on server sometimes you can see Mailboxes with status Disconnected. There may be more than one reasons for disconnected mailbox. If mailboxes are disconnected because they do not have ‘Mailbox Rights’, you can grant ‘Mailbox Rights’ to disconnected mailboxes. Next you can select folder from folder tree in connected mailbox and then you will see all messages in those folder. How fast messages will be loaded it depends on how many messages are in this folder. Now you can export one or more emails to .MSG or .EML file or you can export whole mailbox to .PST file or separate .MSG, .EML files. In Stellar EDB to PST Converter windows you can see message body and attachment but you can’t open attachment. 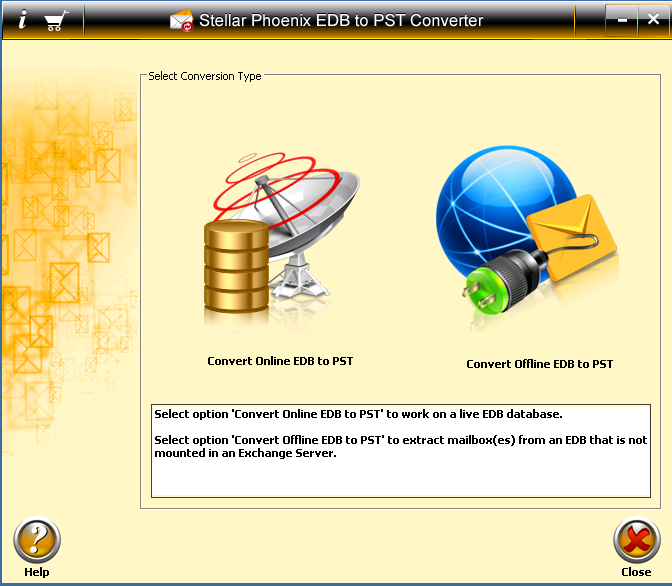 Another option in Stellar Phoenix EDB to PST Converter is to run it to work with offline EDB file. In new window you can select .EDB file and select Exchange Server version. 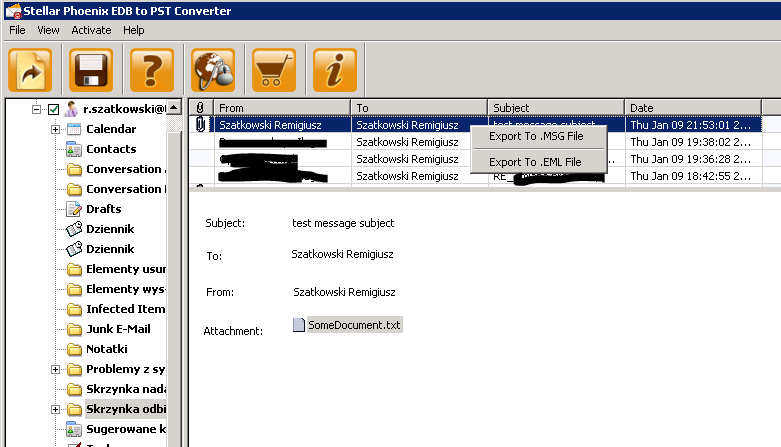 Converter will scan mailbox database .EDB file and will show you all mailboxes which this file contain. This porocess will take some time. Next you can export mailboxes to .PST file like before in online mode. 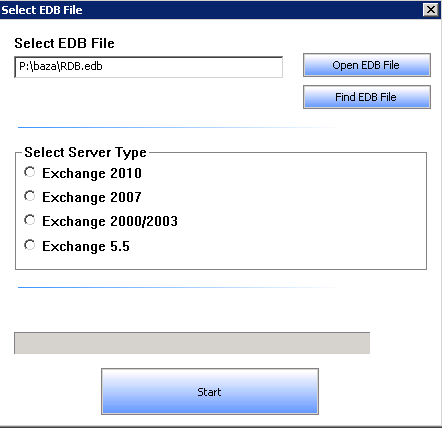 Converts ‘Online’ Exchange database (EDB) to PST file(s). Converts ‘Offline’ Exchange database (EDB) to PST file(s). Supports PUB.EDB files for ‘Offline’ conversion. Selective conversion of user mailboxes to PST file(s). Supports MS Office 2000, 2003, 2007, and 2010. Supports MS Exchange Server 5.5 / 2000 / 2003 / 2007 / 2010. Provides preview of mailboxes and mailbox items such as – ‘Emails’, ‘Contacts’, ‘Calendar’, ‘Notes’, ‘Attachments’, ‘Sent items’ etc. Compatible with Windows XP / 2003 / Vista / Windows 7/ Windows 8. This tool looks good and it works. All Microsoft Exchange server administrators need tool like this to open and export mailboxes from .EDB file. This is your choice which tool to use and how much you can pay for it. I am thinking to buy this tool to perform online migrations. So just wanted to know howz your experience with online mode of this tool. Before buying a license of EDB to PST converting tool, I made sure that japanese language was supported by contacting them. Unfortunately, after a few tests, when the tool is in “Offline mode”, it cannot read correctly information from EDB file. The japanese characters are all messed up, useless for us. I contacted the support, provided a sample edb file and after a few mails finally the problem was escalated. Finally they said that they could reproduce the problem and that next version would contain the fix ! But they had no visibility about when next version would be available, I just had to check their website regularly.. Finally I tried the new version after a few months and of course the problem is not fixed at all !